North Branch Park is very near the traffic circle junction of NJ Routes 22, 28, 202, and 206, near Somerville. Follow 202 South from the circle for 2 miles, past Bridgewater Towne Centre Shopping Mall (Wegmans), under railroad trestle marked "4H is Tops", to right turn onto Milltown Road. Make first left after firehouse and 4H Center on right; follow path to open field. Monthly launches from 10-4. AMENITIES Public Restrooms on site. Fast food locations (Dunkin' Doughnuts & McDonald's) on Rt. 202. EQUIPMENT Launching your rocket with GSSS is free. GSSS provides launching facilities and operates under the mis-fire alley protocols. You must supply your own rockets, wadding, rocket motors and ignitors. MODEL ROCKET SUPPLIES If you wish to purchase motors and other hobby items on-site, Heavenly Hobbies is usually present at the field. We highly recommend you contact them first with your needs and to confirm their attendance and let them know if you need something particular so they can bring it. Toys R Us, Michael's, and Walmart are in the area too and carry some model rocket items. All models/launches to be in compliance with the NAR Model Rocket.Safety Code. All models ready to launch must be presented to the RSO for a safety check. When using the ALLEY SYSTEM, permission to launch must be given by the RSO. A loud 5 second countdown must be used before launch. An attempt MUST be made to insure that all models are recovered within the boundries of the park. Using engine/recovery systems compatible with wind conditions etc. (This does not apply at contests). High power (Over 30 Newton-seconds) flights, when allowed by the RSO will be ignited from a minimum distance of 30 feet. (Recovery as in rule #4). MOD-ROC flights will be allowed at the discretion of the RSO. (Recovery as in rule #4). Entry and exit from the launch area will be from one end only, at the R S O table. Static testing of engines will not be allowed. All prepping of models will be done outside of launch area. 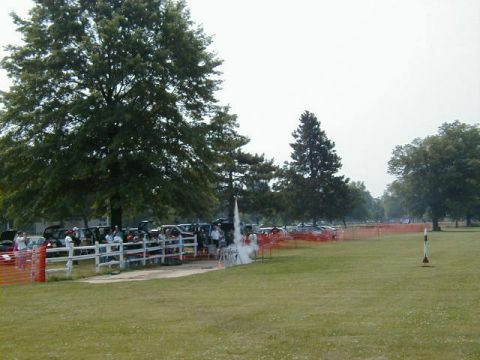 Alcohol is not allowed at any GSSS model rocket launch. Please keep in mind that the park and weather conditions dictate what we allow to fly. If the Range Safety Officer (RSO) does not feel the model can be safely flown or recovered within the park's boundries, it will not be flown regardless of the weight or impulse. If some other activity shows up and starts using the adjoining fields, the RSO will reduce impulse for all flights. So, bring some small stuff just in case. Remember, we share the park. We do not pay a fee and most of us are not a resident of that county. Rocket flying fields in New Jersey are in short supply, and we are protective of the fields we have. If you are unhappy with this limitation, then we invite you to help us in gaining legal access to privately owned, large, open fields.